As I had said in my previous post, I was unhappy with how my last review had come together. So I am re-doing it. To start with, I read this book in less then a week. And considering the size, 434 pages, that is pretty good timing with me. I actually didn’t read for 2 of those days during the week. I absolutely loved this book. Loved the story. The characters. The writing. Everything. We start off with Kelsea looking down at the Queens Guard from a tree. They are coming for her, on her nineteenth birthday, to bring her to the Keep and to be queen, her birthright title. During the opening and the start of traveling Kelsea thinks back to her time growing up in this secluded cottage with no one else except her foster parents. How they had taught her some things about being queen. About how her foster mother was always stern and didn’t seem like she truly cared about her. About how she will miss her foster parents library. I do love that Kelsea is a book worm. It makes me feel connected to her just a little bit, when I have nothing else in common with her. When they leave her foster mother, Carlin, tells her there is a gift in her satchel and to open it later. Alone. And so Kelsea leaves with the Guards. 8 or 9 of them. I can’t remember. When they make camp the first night she makes sure to help where ever she can, this includes tending the mare they gave to her. Once she is settled, so looks through the satchel to find the gift that Carlin gave to her. Inside an envelope she finds a sapphire on a necklace, identical to the one she has worn her entire life. On the envelope Carlin had wrote a message. Just one word. Careful. Kelsea burns the envelope and tucks the necklace into a pocket in her coat. Keep in mind, this has happened within the first 100 pages. But it sure doesn’t feel like I had read that much. As they continue to travel the guards notice they are being tracked by hawks that the Red Queen has designed. So they all split up. Kelsea goes with a guard named Lazarus, but everyone else calls him Mace. They ride as fast as they can, but eventually some Caden assassins catch up to them. At this point Kelsea’s horse had thrown her off because it misunderstood a direction, and she is laying half in an half out of consciousness while Mace is fighting these Caden. These legendary assassins. He takes out all four without trouble. But there are more people. They aren’t Caden, but they still can’t be good, right? Well. Yes they are not good. But they save Kelsea and the Mace from the other Caden that are riding towards them. One of them, the leader named the Fetch, treats Kelsea’s wound on her neck, and they take the pair down south, no where near where the Keep is. They stay there for a few days, Kelsea able to walk around. The Mace is kept as a prisoner. Kelsea is attracted to the Fetch, but apparently she is to plain for him. Whatever. Also, the Fetch takes the second necklace, the one from Carlin, and says he will give it back when she has proven herself. Eventually Kelsea and the Mace are set free and start riding to the Keep. It takes a couple days, and they have to be careful that no one recognizes either of them. considering Kelsea’s uncle, the Regent, has a bounty on her head. Soon they make it to New London and ride to the Keep. thank goodness they arrived when they did, because Kelsea stopped a terrible thing from happening. In the Tearling once a month 250 people are shipped to Mortmense as payment for the treaty. This just happened to be when Kelsea showed up. And stopped the shipment. Effectively declaring war against the Red Queen. She released everyone in the cages and had her guards burn them. Mace also noticed a few women that were hanging around the keep lawn and offered to them the chance to come inside and work for the queen. In exchange they would never have to worry about their children being in harms way again. When they finally went inside, Kelsea basically collapsed onto the bed that was her mothers. The next day when she awoke it was time for her to be crowned. She had Mace find a good priest to do so. When he found one, they went into the grand room, where her uncle was holding an audience. The hall was full of the rich, and only the rich. Her uncle was someone that obviously had no thought for the people of the kingdom he was looking over. For the last 13 years. Spending the kingdoms money on useless things, like women and junk art. During Kelsea’s crowning someone throws a knife at her and it gets lodged in her back. She is bleeding to death with fighting all around her and yet she is still telling Father Tyler to continue with the crowning. And she has the willpower to tell him that she does not want the church and the kingdom to be one. Like it had been in the past. This, among other things, is what made me fall in love with her. Kelsea is such a strong willed and powerful women, she has no idea what she could possibly end up doing. The people of the Tearling call her the True Queen, and I certainly think they are right. She may have a temper, which she states repeatedly, but she has done nothing but look out for the welfare of her people. Quite a few things happen, and there are considerable time jumps, but in summary after the crowning Kelsea was on bed rest for a week for her shoulder to heal. Guards moved their families in. The women got situated, and Andalie became her ladies maid. Andalie is a seer, not the best, but she knows when something is going to happen, when Kelsea needs her cup of tea, when Kelsea needs anything really. Kelsea has also started having visions here and there. The first, she was a bird in the Mort territory and she saw the army. And the cannons. The second was much later on, but she was looking through the eyes of a woman whose village was being raided and people were being taken. When she woke up Kelsea was determined to go after them to save her people. And go after them she did. And save them she also did. But not without almost dying, and figuring out who had been betraying her. Some other things happen too. Mace sends Dyer to get the books from the cottage. She almost gets killed while taking a bath. The Fetch kills her uncles. The Fetch gives her the other necklace back after Kelsea’s fight to save her people. She sends troops to intercept the Mort Army. I feel like this would make an amazing TV show. One I would be waiting each week to watch. I hear they are making it into a movie, but I do not feel like it will do it the justice it deserves. And it does indeed deserve a lot. I honestly find no fault with this book. It is written in multiple perspectives so you aren’t missing out on any story that you need to know right now. It’s not over descriptive or under descriptive. It’s just right. It satisfies all my book reading needs. 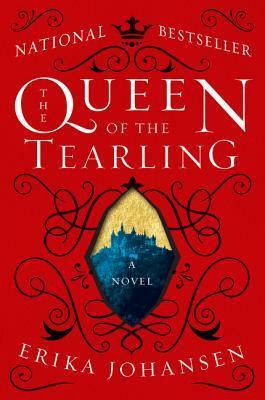 This entry was posted in Book, Book Review and tagged adult, army, author, book, book review, book reviewer, books, death, erika johansen, qott, queen, queen of the tearling, red queen, review, reviewer, the queen of the tearling, tqott, war. Bookmark the permalink.